Starting tomorrow through Sunday, June 1st, you get a free Buxom lipgloss when you purchase two RareMinerals products at Bare Escentuals on 34th Street. 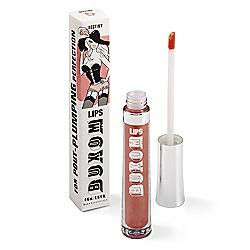 Normally $18, and who doesn't want big buxom lips? I can't wait to try this. Go here for Borders coupons good through this weekend. Thanks to my office mate Catherine for finding this on LivingFreeNYC on Twitter. 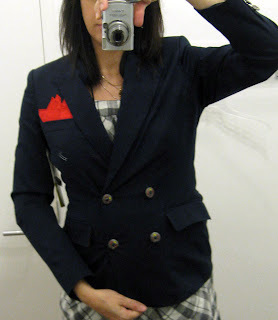 WendyB's updated post reminded me that the pocket square Francis jacket (left) is now 40% off at Macy's. I saw it yesterday on a 2nd floor sales. It might even be further off this weekend, as there is an extra 10%-20% off this weekend at Macy's Herald Square this weekend. The guys have to visit this weekend, as they get an extra 25% off their entire clothing purchase of $100 or more. Go here to get the coupon. Last, I updated the thriftnyc section with some newly opened thrift stores from Time Out New York. Check it out if you're coming to town for a visit, or if you're a dedicated thrifter.